With Sol, business is easy. Increase your revenue by partnering with a pioneering leader in the growing solar lighting industry. Enjoy more business, more income, and more opportunity. Who should become a Sol Certified Contractor? The Sol Certified Contractor Program is for contractors wanting to get into the business of solar lighting installation. We’ll send you business. Our agent network is working to specify our product—and our Sol Certified Contractors—for each installation. We’ll provide you with revenue opportunities. Get direct access to product to be more competitive. We won’t waste your time. Our short, comprehensive training program and installation support help you and your team install faster. Follow our short training program. Stay connected with newsletters and training. Join us as a contractor and see how we can be more successful when we work together. Need more information? Download our Sol Certified Contractor Overview. Put the power of solar to work for your business. 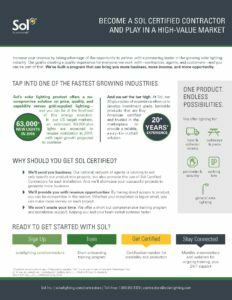 Sol’s Certified Agent training program provides you with the knowledge, support, and experience you’ll need to enter the growing world of solar outdoor lighting. In this self-directed online course, you will learn the ins and outs of our processes—from ordering to contractor commissioning, and everything in between. We provide a series of helpful documents, presentations, and “cheat sheets” to help you land that sale. Our team is available to chat from 9am to 4pm PST. Need immediate support? Give us a call now! Download our EverGen Setup App to commission your project.